Tackling and being tackled are integral parts of rugby. Tackles can range from almost gentle ankle taps to bone-crunchers that hurt so bad they send shockwaves throughout your entire family tree. Delivering a good tackle is generally more enjoyable than being tackled, but both ends of the impact can take their toll on your body. It pays to be physically and mentally prepared so that your next tackle doesn’t leave you on the ground and out of the game for long. Depending on your position, you can expect to tackle 20+ times per game and will also experience numerous other big hits. To excel at tacking, and recover from these and other impacts, ruggers need to train accordingly. While strength and size play an important role in tacking, it’s also a skill. When properly trained, a small player will be able to deliver hits that are just as devastating as a bigger, less skilled player. Before trying to tackle with full power, make sure you are technically proficient. Here are five tips that every hard-tackling rugger needs to master. Avoid being penalized for high tackles, stop the opposing player more effectively, and reduce the risk of injury to you and the person you are tacking by aiming for the shorts. If you hit at shorts-height, you are more likely to execute a successful tackle. Tacking with outstretched arms is a great way to get injured. Hitting with arms outstretched puts your shoulder in a mechanically weak position. At best, you’ll probably suffer a rotator cuff injury. At worse, you could dislocate your shoulder. In contrast, hitting with the shoulder produces a more aggressive impact and also reduces stress on the shoulder joints. Think of your shoulder as a weapon, albeit one that is NOT unbreakable. However, do not perform shoulder-only tackles (shoulder barges) as they are both dangerous and illegal. Avoid trying to grab your target in a tackle with your hands. Even if you have a vice-like grip, it’s relatively easy to shake off a hands-only tackle. Instead, envelop your victim in your arms. This will remind you not to tackle with extended arms, producing a better tackle, and reduce your risk of injury. Practice tackling while holding tennis balls in your hands to practice wrapping and prevent grabbing. Try to keep your eyes open when going into a tackle. It’s natural to want to shut your eyes but doing so could mean you end up missing your victim entirely or hitting them somewhere other than the intended part of their body. Practice this in training at ever-increasing speeds to master this important skill. Once you have mastered the basics of safe and effective tackling, you should not spend too much time working on tackle bags. Tackle bags allow you to attempt tackles that won’t work or could even be dangerous if attempted against another player. Too much tackle bag work could teach you bad habits that are hard to shake on the pitch. For example, flying in at the wrong angle or tackling with extended arms might work out fine with a tackle bag, but end in disaster in a game. A good tackle requires strong, powerful legs, core strength, and shoulder stability. This will produce optimal force transference from the tackler to the target while minimizing the risk of injury. If any of this links are weak, the tackle will be less effective. Studies by the exercise science department at the Australian Catholic University in Brisbane (1) revealed that tacking ability is closely related to lower body strength and power. Increases in 1RM squat are usually accompanied by an increase in tackling performance. This makes a lot of sense because the lower body is the main player in generating force in a tackle. A good tackle starts with your leg drive. To develop strength and power for tackling, ruggers should build their workouts around the following exercises while training to increase or at least maintain their 1RM. For best results, follow a periodized strength and power training program. Not sure where to start? We’ve got lots of free plans designed specifically for ruggers like you! Lack of core strength means that, when you tackle, some of force generated by your legs will never make it to your target. Instead, it will dissipate in your midsection, potentially resulting in injury. A strong core will ensure that your spine stays properly aligned and rigid so that all that tacking force reaches its intended victim while keeping your spine stable. Rugby players need all-around core strength. It’s not enough to be the king of weighted crunches or sit-ups as those exercises only work the anterior or front of your core. You also need lateral (side), posterior (rear), and rotational core strength. A lot of exercisers, even ruggers, make the mistake of doing lots of high-rep core training. While this will help increase local muscle endurance, it won’t do much for what you really need – strength. The core impact in a tackle comes on in an instant and is very intense. Sets of 50 crunches will not help prepare your muscles for this kind of onslaught. Subsequently, make sure you train your core the way you need it to perform on the field – with heavy loads, relatively few reps (5-10) and progressive overload to ensure they continue to get stronger. 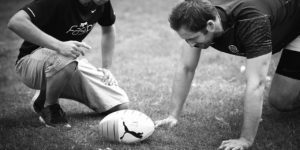 Learn more about rugby core training in this article. If you warp your arms properly, you should take a lot of the stress of the tackle off your shoulders. However, even then a) you’ll still be taking most of the impact through your shoulders and b) accidents happen and increasing shoulder strength and stability will reduce your risk of injury. Your shoulders are a complex joint capable of a wide range of motion. They are also the most commonly injured joint in rugby. Building rugby-proof shoulders requires more than overhead pressing, although that is a good exercise for developing strong delts. Stability comes from strengthening the deep shoulder muscles, known as the rotator cuff. 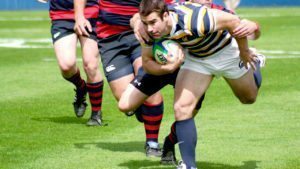 Learn more about shoulder training for ruggers in this article. You’ll also find more info on joint-by-joint rugby prehab in this free e-book. To be a successful rugby player, irrespective of your position, you need to be a good tackler. A poor tackler is a liability and that missed or ineffective tackle could mean the difference between winning or losing. Practice the skills of tackling regularly and train your body to not only hit hard but recover quickly from the impact.